The past month my facebook feed consistently features family after family in fields of bluebonnets. And I love it. Just as the flurry of back to school pictures in August or the Halloween costumes captured in October, this seasonal burst of snapshots of kids crouching down in a sea of blue wildflowers makes me smile. My husband and I moved to the Austin area right after our March wedding. Just a few weeks later, the iconic bluebonnets sprang up in a field down the street from our duplex. So what did we do? Like every state-honoring citizen living in the hill country, we traipsed to the perfect patch, knelt down, and captured the moments on film (yes, film). And we’ve been doing it every year since. Sixteen years and counting. Now with four kids. 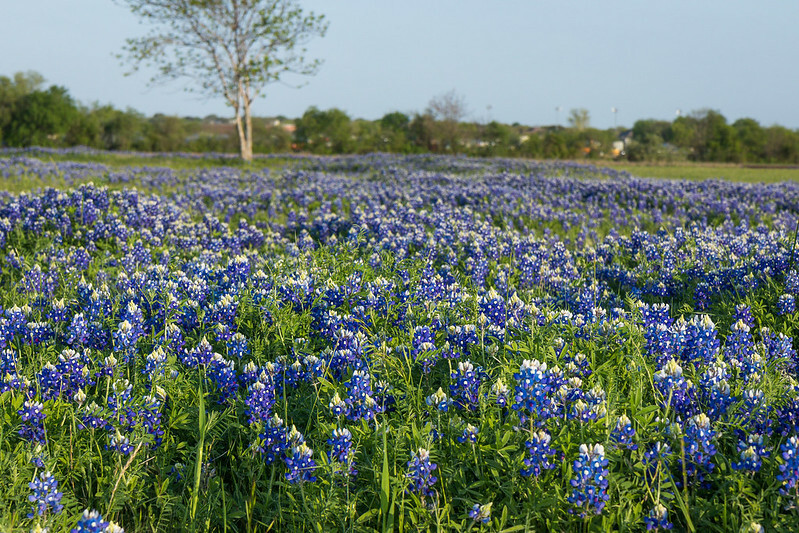 Why do Texans love bluebonnets? What’s so special about these slender blue flowers? What causes families to stop by the side of the road, piling out of their minivan to pose in a patch of wildflowers? Bluebonnets appear year after year. With inconsistent consistency, bluebonnets spring up, signaling the end of winter. We don’t know the exact day the slender stems will spring up. We can’t control their arrival, but we do know they’ll come. God reveals this truth every spring as trees blossom and flowers bloom, reminding us of new life. Like nature around us, we experience growth that is ultimately out of our control, most likely different than our timing, and with a reality inconsistent to our desired expectation. But there is growth. Seeds are scattered across the fields of our souls, and we trust the changeless Sower with the timing and placement of his purposeful sprouts of righteousness. on that day when Jesus Christ returns. Bluebonnets are wild. They grow without the nurture or cultivation of people. Unlike the high-maintenance diva tribe of orchids, gardenias, and azaleas, bluebonnets simply do not require our care. There is something profoundly pleasing in that. An object of exquisite simple beauty exists without any human involvement. In mid-spring as I move through my day, heavy with decisions, duties, and details, my eyes pause to take in the beauty of the scattered blue-topped flowers standing tall in their field. A sight that speaks to my heart. Am I putting too much weight in controlling this day, my way? Just as bluebonnets are not contained within the boundaries of a well-manicured garden, my to-do-list should not be confined within my own strength, timing, and expectations. This life of faith is a bit wild. We serve a God who cannot be contained within the humanness of our minds. His ways are higher. His love is limitless. His grace extends beyond the farthest borders. When I see a field of bluebonnets, I want to be like that wild and carefree flower who is nurtured and cultivated by God alone. If God gives such attention to the appearance of wildflowers—most of which are never even seen— don’t you think he’ll attend to you, take pride in you, do his best for you? 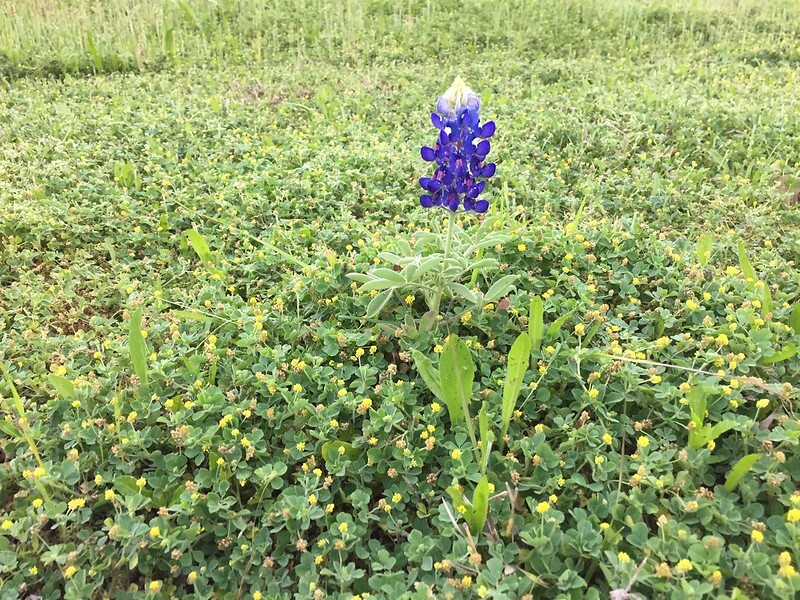 On a recent morning walk, I spotted a single bluebonnet standing alone about twenty feet in front of her group. These flowers enjoy a crowd, so it was unusual to see the lone stem without her friends surrounding her. Captivated, I walked up to the flower and admired the intricate design saturated in a deep bluish-purple hue, her height escalating to kiss the air with a pursed white tip. I’m thankful God made flowers. And not just one type of flower. From my little corner of the world, seeing a variety of blooms in a full palette of hues, each species with an intricate arrangement of blossoms and a unique layering of petals, points me to a Creator who loves beauty and diversity and saturating our world with color. The decision makers of our big Lone Star State chose well. Naming the bluebonnet the official state flower of Texas captures our state identity. 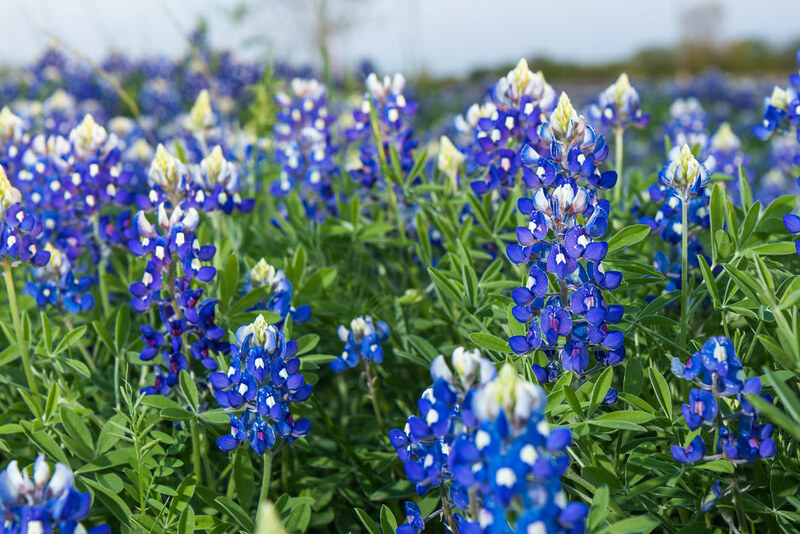 Groups of these wildflowers stand together all across the hill country – in parks, along highways, through fields, beside trails, within fence lines, and beyond the gates. By foot or by car, we see the assemblies of our state flower in places we’ve spotted them before, but also in new communities of growth. And the sight is beautiful. Growing in community is beautiful. When others see a formation of the faithful, comprised of individuals standing beautifully in his or her unique design, they pause and notice. Most likely, the attractive sight will compel an onlooker to pull over, get out, and kneel down. To experience the beauty first hand. The Lord is good to everyone; his compassion rests on all he has made. All you have made will thank you, Lord; the faithful will bless you. informing all people of your mighty acts and of the glorious splendor of your kingdom. Your kingdom is an everlasting kingdom; your rule is for all generations. The Lord is faithful in all his words and gracious in all his actions. If you are a fellow Texan, you get it. You get the big deal about bluebonnets. If you aren’t from Texas, then you probably still don’t get it. You may not care about a blue wildflower. That’s ok. Y’all just need to come down and see ’em (said in my most hospitable drawl). Furniture shopping can be an overwhelming experience. While online sources are growing in popularity, I still recommend shopping locally for important pieces you will use everyday – like a sofa or comfy chair where you’ll go to relax. Think about the furniture shopping process in three steps: before you go, at the store, and after shopping. Follow these tips for an enjoyable and productive shopping experience. The first step in buying furniture is measuring your space and creating a room layout, which can be a sketch or computer-generated drawing. Measure the perimeter of your room and include doorways, windows, and fireplaces. Next, browse the store’s website for styles you like and make a list and/or Pinterest Page, including dimensions and prices if available. Also on the website, look for the services provided by the store, such as delivery, fabric options, and financing. When you see a furniture piece you like, “try it on for size.” Get comfortable on the furniture just as you would at home. If you like to stretch out on your sofa, then go ahead and lay down on ones in the store. You may feel awkward at first, but it is better to know beforehand that the couch is too short for a nap before you have it delivered. If you are married, make sure both spouses take a seat. Body height can greatly affect how the depth of a seat cushion feels. Take pictures of the pieces you like and measure the width, height and depth. Get the sales associate’s name, ask to take a swatch home, and inquire about any current promotions. Check the measurements to see if the furniture will fit in your space. One option is to use masking tape on your floor to show the furniture sizes, or you may want to draw them on your room layout. Then look at the fabric swatch with other furnishings in the room at different times of day. 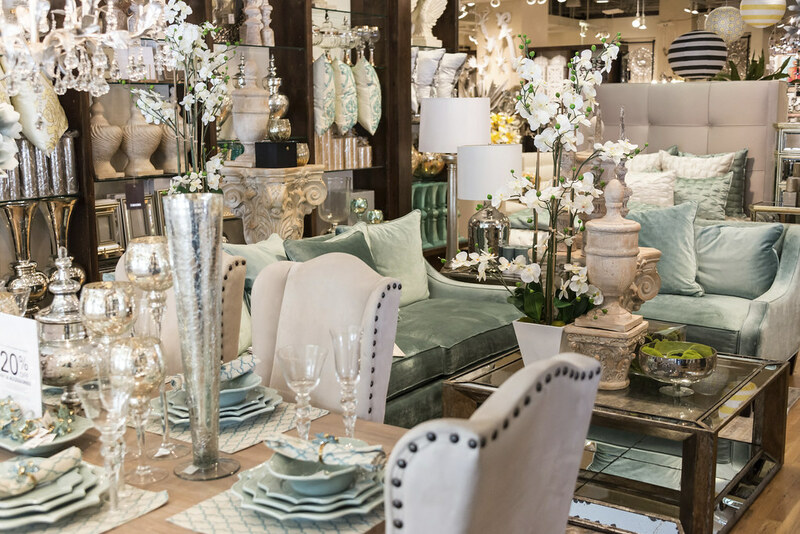 Lighting makes a big difference in the way fabric looks in the store versus how it looks in your home. Before making your final decision, wait at least a day or two to review your findings and discuss with a spouse or friend. Buying furniture is a big decision, so take your time to ensure you make a confident choice. Still not sure or the thought of all this has you feeling overwhelmed? 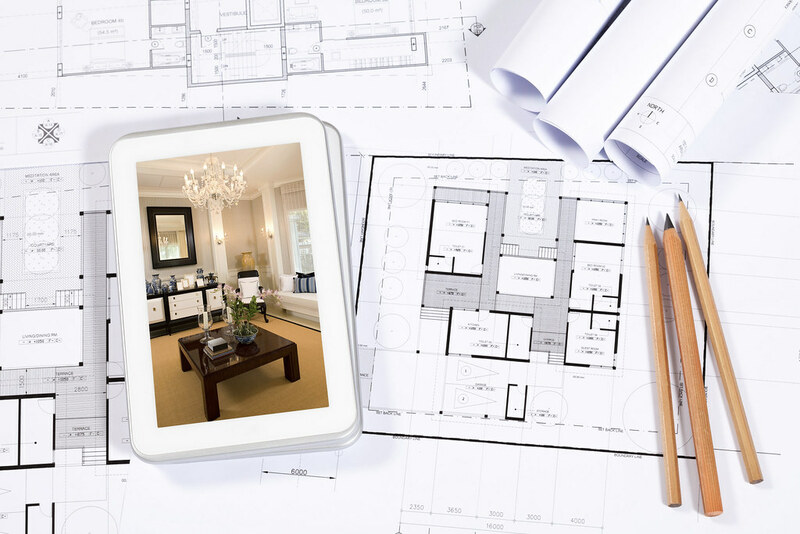 A design consultation can give you peace of mind before making your decision. Room Service provides you with a scaled furniture drawing and suggestions so you’ll know what size pieces will fit in your space. 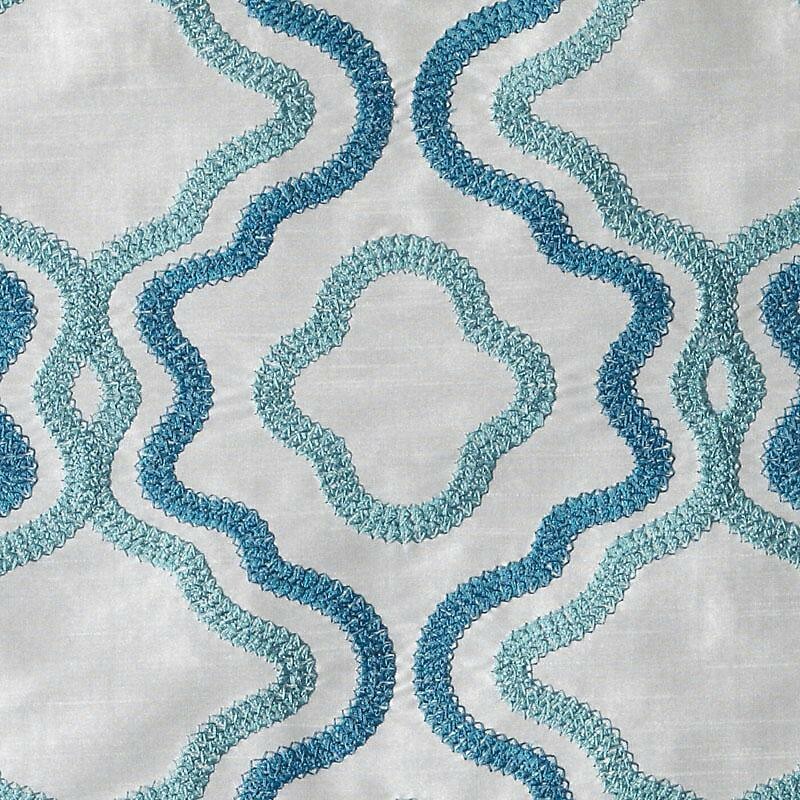 Riya is an exquisite embroidered fabric from India. 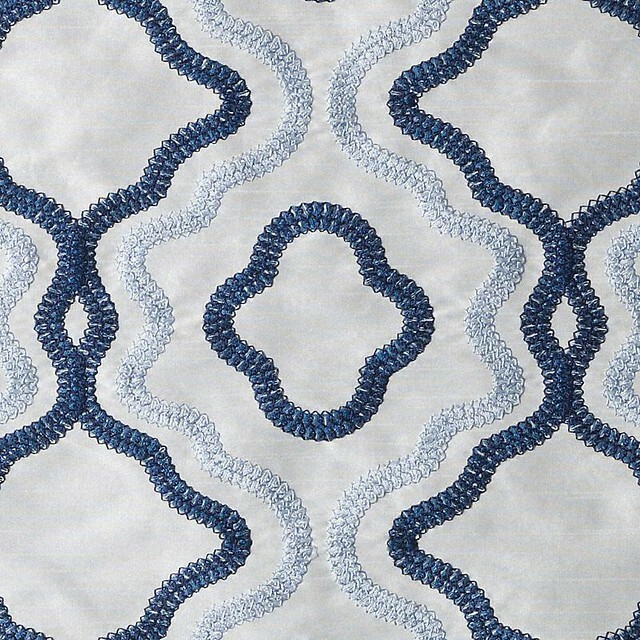 The duet of serpentine thread patterns create visual interest and subtle color without being too formal or busy. 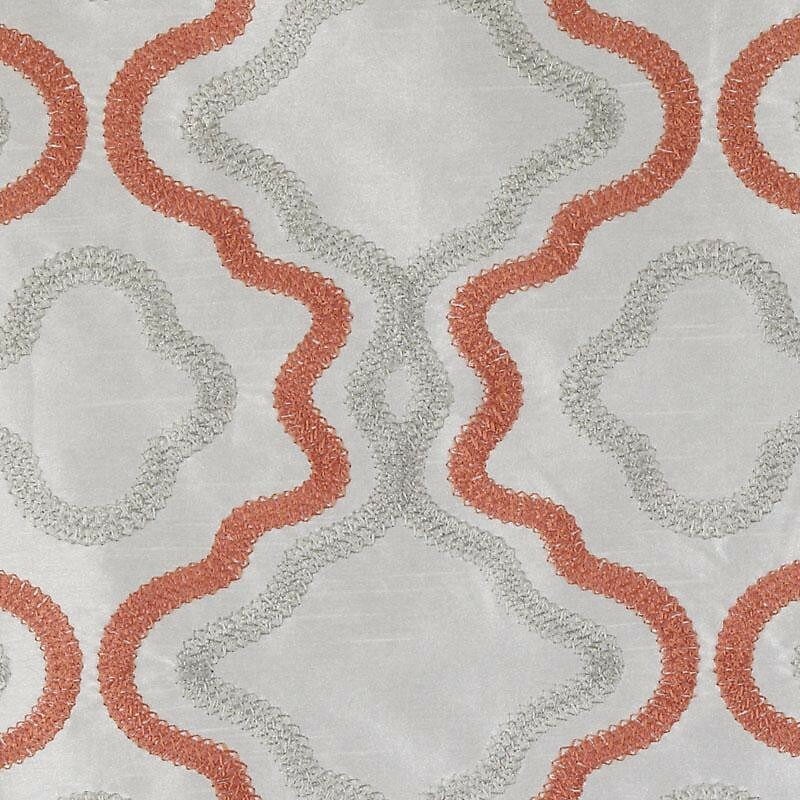 The base cloth and has an understated shimmer, giving the appearance of a silk, but the practicality of a Viscose/Polyester blend. The Riya fabric would be stunning as full side panels in a dining room or an elegant shade in the master bath. Available in Coral, Aqua, Lapis, and Natural/Blue. Alhambra has an overall light feeling with a white 100% cotton background and a soft infusion of colors. This interesting, yet not-too-busy pattern is fairly large (27″ vertical & horizontal repeats), yet would fold into pleats beautifully as a pair of window panels. It would also be very inviting as a duvet cover or several down-filled pillows. With so many paint colors that would blend with Alhambra – Sherwin William’s mink, aquaverde, bee, and croissant – using this fabric as your room inspiration would create a stunning space that could lean in several style directions . . . farmhouse/rustic, classic/elegant, or fresh/modern. 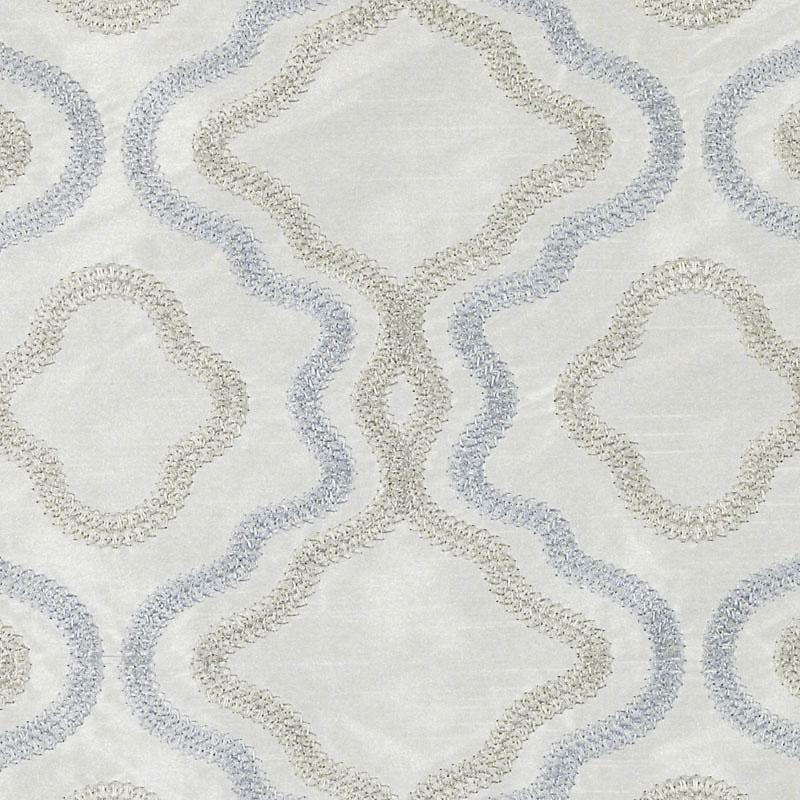 Alhambra is a lovely fabric – interesting pattern, pleasing palette, and versatile style. Available in Aqua, Nautical, Honey and Orange. 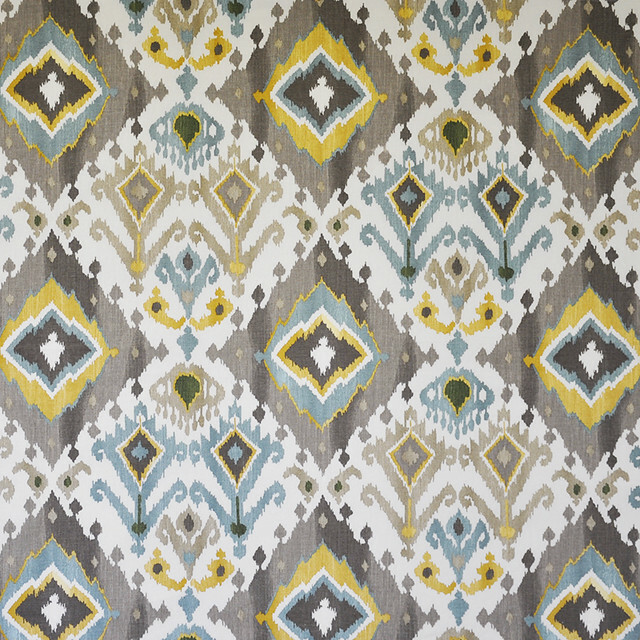 Meet the Batavia Ikat fabric family, featuring a lovely ikat [ee-kaht] design and versatile color combinations . . .
First, I present to you Miss Amethyst Batavia Ikat, who allures us with her casual sophistication. Deep purple provides a luscious background for the copper, ivory, and lighter purple color scheme . 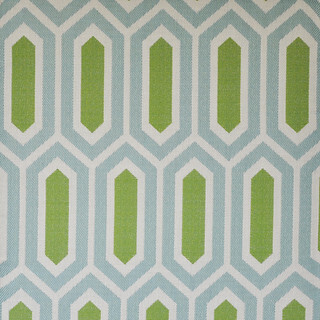 . .
Today’s featured fabric is Sweet Treat in color Candy. Doesn’t that make you smile? I was in a designer showroom recently and this book not only caught my eye, but made me stop. It was, as the pattern says, a treat for my eyes. More love please! This trend in the Sherwin Williams 2016 Design Forecast is social, fun, feminine, playful, and happy with vintage undertones. It’s all about sharing the love locally, engaging in actual social gatherings, not just social media. Social. Change. Playful. Indulgence. Here is Mas Amor Por Favor . . .
Do you like the idea of a room described as peaceful, simplistic, pure, relaxing, luminous and natural? Inspired by Pura Vida in the Sherwin Williams 2016 Design Forecast, this collection of furnishings beckons you to unwind and exhale. The complete collection of Pura Vida home decor is on my Pinterest page, and if you’d like more info on the items featured, email me. Breathe deep and enjoy! This concept of pure & full life is so much more than natural home decor or soothing paint colors. Here are some of my favorite things that contribute to a full life – or my own Pura Vida. A phrase commonly used in Costa Rica, “pura vida” is Spanish for “pure life.” A yearning for simplicity, lightness, peacefulness. Unplugged. Natural. Wellness. Spiritual. Here is Pura Vida . . .
© Copyright 2016. Valerie Griffin Design. All Rights Reserved.